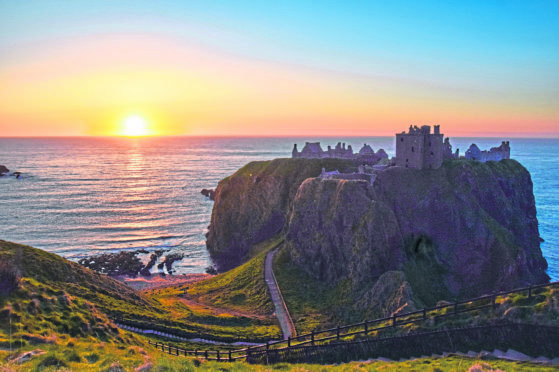 Tourist hotspot Dunnottar Castle is one of the many Aberdeenshire destinations which lends itself to a Norwegian market. The tourism board for the north-east has joined forces with an international airline for its first collaborative campaign to market Aberdeen city and shire as the perfect festive holiday destination. VisitAberdeenshire is hoping to entice Norwegians to hop over the North Sea to take advantage of the county’s cheaper shops and natural beauty by partnering with Wideroe. Tourism chief Chris Foy, who heads the organisation, said they were targeting the Norwegian market due to our proximity and ease of access. He said that while that in itself is not enough to get people to book a trip here, our attractions and experiences are all of interest to the Norwegian market. The initiative is part of the region’s bigger plan to grow tourism across the north-east, turning it into a £1 billion industry by 2023. He said shopping – particularly at Primark – was a strong feature of the Norwegian market, and the tourist agency had recently seen an emerging trend coming from the younger generation of travellers who are interested in adventure-based activities including climbing mountains and kayaking. Mr Foy said: “We have launched a partnership campaign with Wideroe airlines to promote the direct flights from Norway to Aberdeen with the objective to increase the number of leisure visitors to the north-east during the winter months. Wideroe is the largest regional airline operating in the Nordic countries. It has a fleet of 40 Bombardier Dash 8 aircraft, and 3 Embraer E190-E2 aircraft which serves 41 domestic and six international destinations.